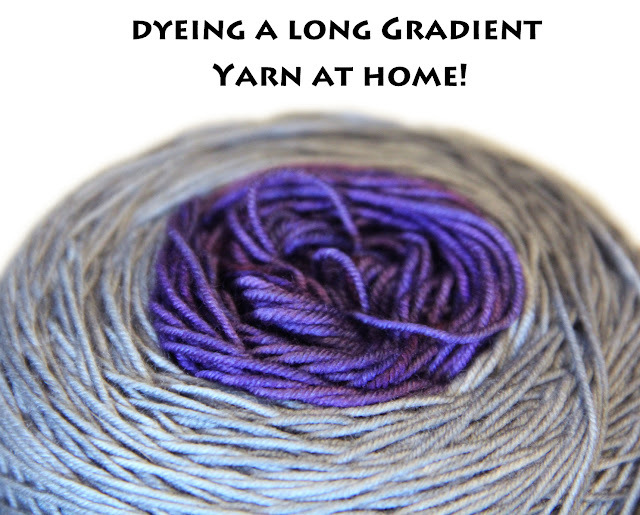 Nelkin Designs Blog: Dyeing a Long Gradient Yarn at Home with Food Dye! Dyeing a Long Gradient Yarn at Home with Food Dye! I've been finding that it isn't as easy to find super long gradient yarns as I thought it would be for Circo Mystery Cowl KAL and decided to teach you how to make your own! I used to dye yarn for many of my weaving projects in college and it was great fun to resurrect my dyeing skills. The instructions below use readily available materials and can be done in your kitchen as the dyes are food safe. I used Jill Draper Makes Stuff Esopus in Ash. I took about 3/4 of my yarn and wound it into a ball and left the last 1/4 in a skein to dye. 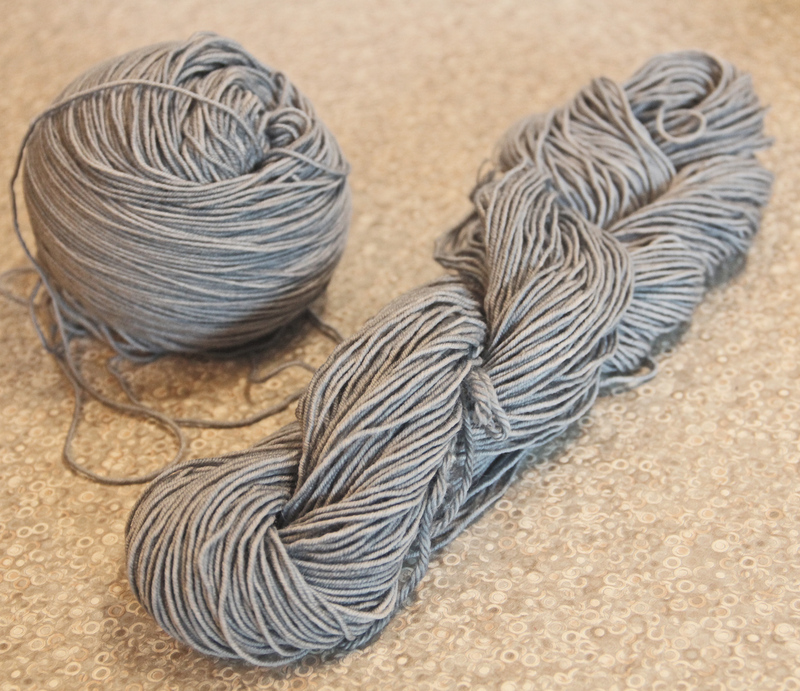 If you decide to dye yarn for Circo Cowl MKAL, you'll want to wind 275ish yards into a ball and dye the rest. Soak the "skein" end of your yarn in a solution of 3 parts of water to 1 part of vinegar for at least 1 hour if not more. This helps wet and prep your skein so that it is ready to take on the dye. Take your yarn out of the bowl and squeeze it out. Dump out your vinegar water. With gloves on, dilute dye into 1/2 cup warm water (in the bowl from above)... ensure that all the dye is dissolved and no lumps are left. I used about 2 teaspoons of Wilton Icing Dye. Use more if you want a saturated/darker color, and less if you want it lighter. You can always re-dye your yarn if it isn't dark enough but it is hard to get the dye out once it is set. Keeping gloves on, place wetted yarn into dye solution. Add more water so that your yarn is covered. 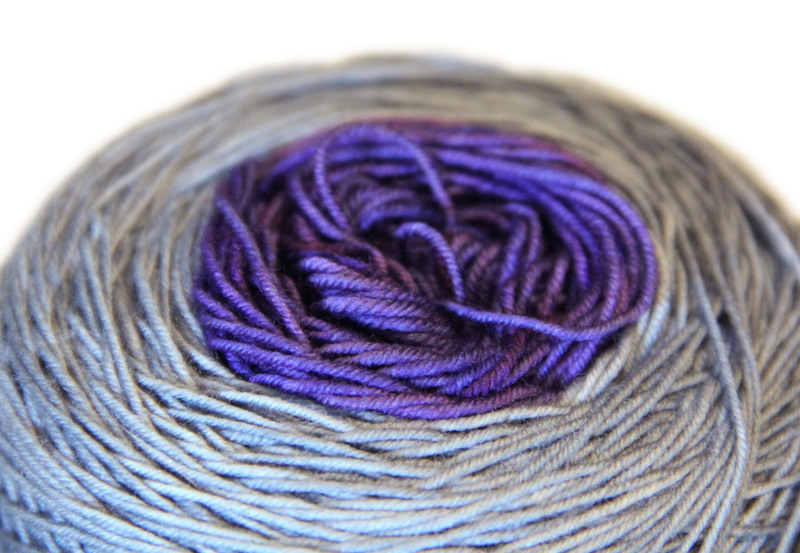 With gloves or spoon stir around gently making sure the dye penetrates your yarn evenly. 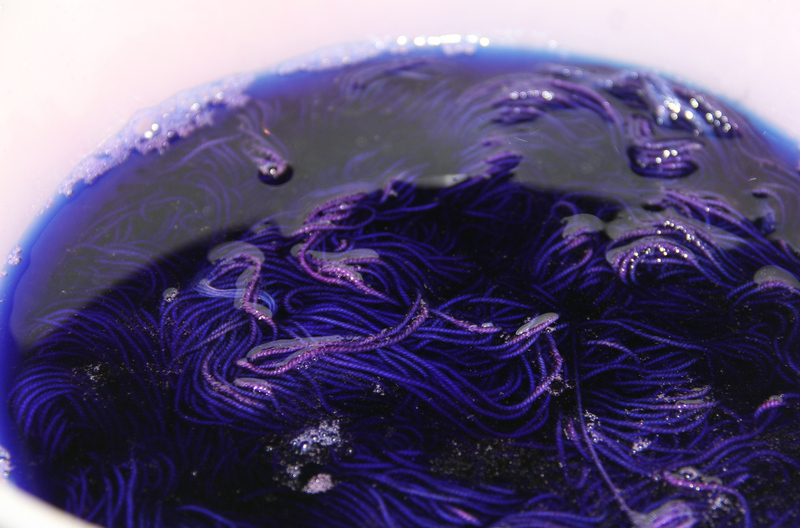 Place bowl of yarn and dye into microwave and cook on high for 3 - 5 minutes. Let stand for 3-5 minutes. 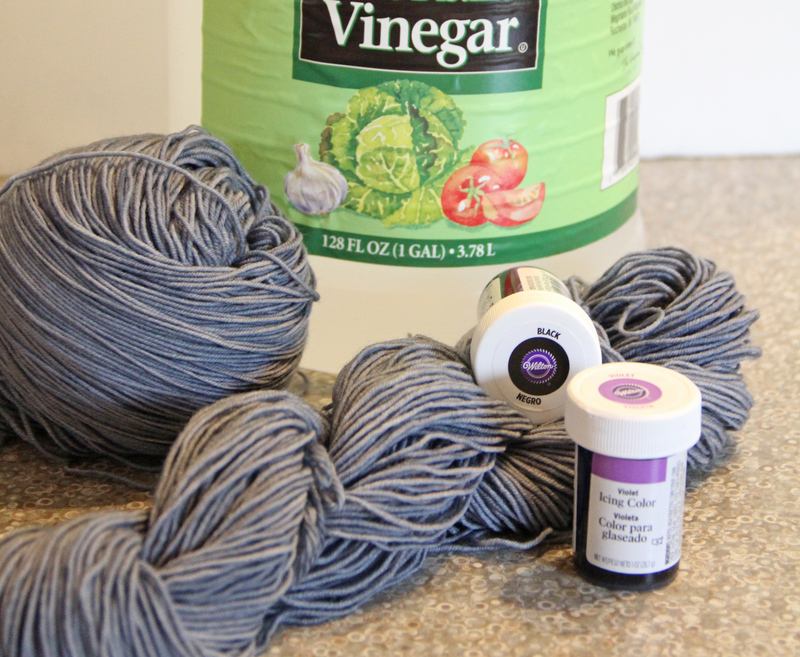 Carefully lift yarn out of bowl and add big glug of vinegar (like one cup), stir it and add the yarn back in. Cook and let cool as you did before until your dye water is clear which means all the dye has bonded with your yarn. (At least 2 more times.) Do not worry if your dye bath doesn't exhaust. Just continue below. 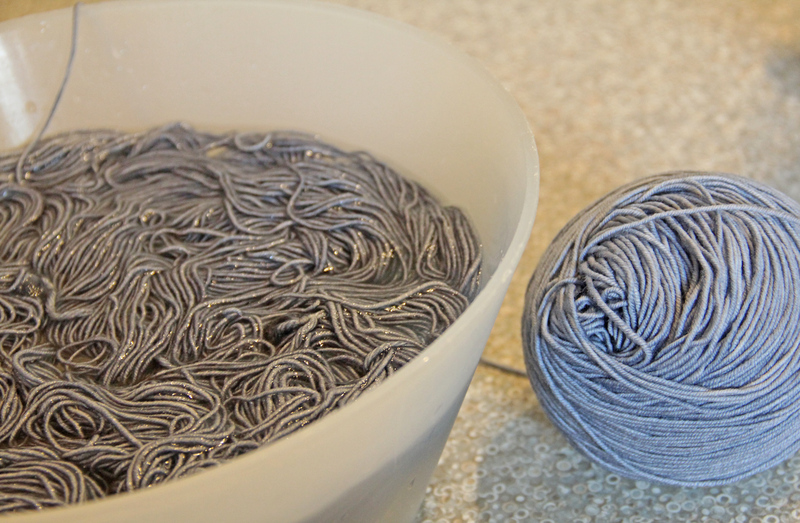 Allow your yarn to sit in the dye bath and let it cool down. If your water didn't run clear you can "re-cook" it with more vinegar and water. Make a solution of 50/50 water/vinegar and put yarn in it. Cook/cool as you did before until water is clear. Then let it cool and rinse out as in Step 7. Take your yarn and wind it into a pretty gradient ball! If you are dyeing your yarn for Circo know that I knit the dark end of the skein left, so I wound that to the inside of the ball. 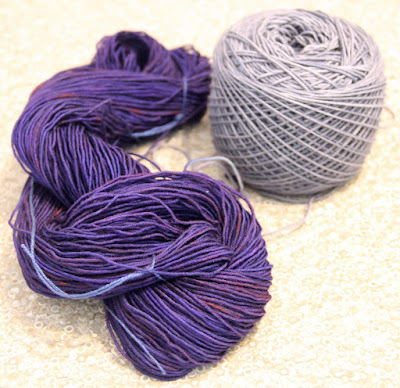 Note: This style of gradient dyeing gives a pretty hard "line" between the two colors, if you want a more gradual shift from color to color you have to dye the end of a sock blank. I don't have a knitting machine, and life is TOO SHORT to knit a sock blank by hand and then dye it and rip it out. I have heard you can soak a tightly bound ball of yarn and just let the dye penetrate the outside of the ball, but I'm not sure how to set this. That is an experiment for another day! Congrats to you Suzie! Very happy for you. I'm planning the ball method tomorrow, that will be fun! Thank you for the great explanation on dyeing the yarn and congrats Suzie! I'm so excited for you! Woot! Love your blog post. Congratulations Suzie! Your instructions are is great, Laura! Thanks for Letting us know what you did. If, once the dyed yarn is dry, you decide that it's not dark enough, would you just follow the same process again to darken it? Thanks Jennifer! Follow them exactly as above, but you can skip the winding step as that is already done! what you could do, though, is just dye the last bit darker and then there would be an intermediate shade as part of the gradient. Congratulations, Suzie. The colour gradient is luscious. Congrats Suzie!!! So happy for you! 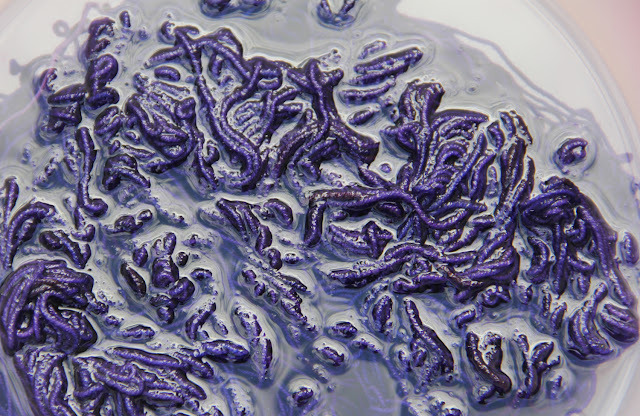 One question tho … what do you do with the other end of the yarn while the part you're dyeing is in the microwave ? I have that inside the microwave next to the bowl, so it spins around with it, but isn't sitting in the dye! Sooooo excited and shocked really!!!! Thank you Laura for such an amazing treat and thank you my dear friends for your kindness and wished. So looking forward to this MKAL and getting back with my friends! I'm confused...there is one skein of grey and one purple, that you dye? How is that gradient? Hi Kim, What I did is overdye one end of a grey skein of yarn with purple dye to create a shift from grey to purple.... you can see in the notes above that this style gives a pretty hard "line" between the two colors, if you want a more gradual shift from color to color you have to dye the end of a sock blank or use another gradient dyeing style. Wind yarn into several small skeins and use increasingly weaker dye solution for each one - that will give you a smooth long gradient. Mouette Scarflette: An M Club Bonus Pattern!